Remember when orchids were rare? Now every grocery store in America has them. Luckily for all you kind readers, I have a few secrets to make them look like they came from a high-end, fancy floral shop. Phalaenopsis are the most popular orchids and come in almost every color under the rainbow. White are the norm……I prefer yellow. Always choose a plant with firm flowers, and a few buds that haven’t opened yet. Nabbed this beauty at Brumley Gardens here in Oak Cliff. Pretty good price for a two-stemer. Start by removing the plant from the store pot, and running it under cool water to throughly wet the roots. Orchids like to be moist, but not sitting in water. I then slide the plastic pot into a clean tomato can. I love the way the graphic label matches the flower colors. Love the whole irreverence of the can too. Use whatever you have; Chinese take-out boxes, baskets, trophies, even paint cans. Anything works for orchids. These little clips are the bane of my existence, functional….but oooh so ugly. Pull them off quickly….and discard. I also remove the overly dyed green bamboo and replace it with something fresher……like tan bamboo. 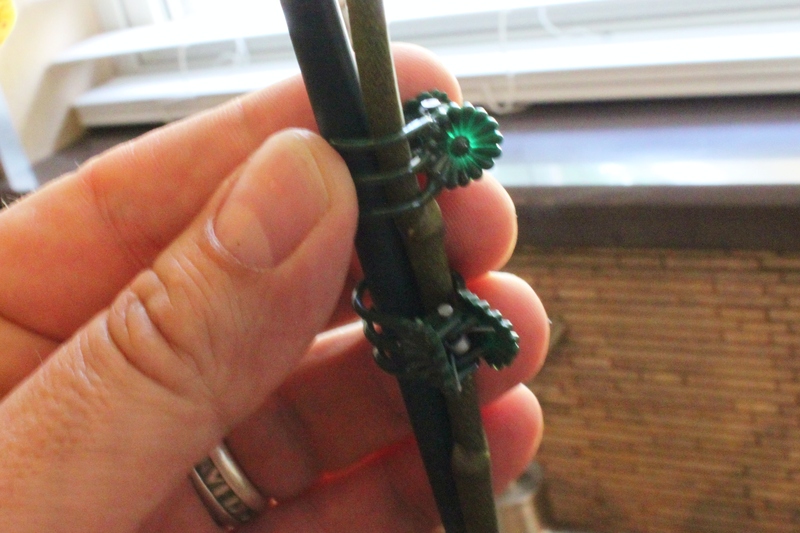 I have been known to use chop stix…or even number 2 pencils. You know, when I’m feeling whimsical. 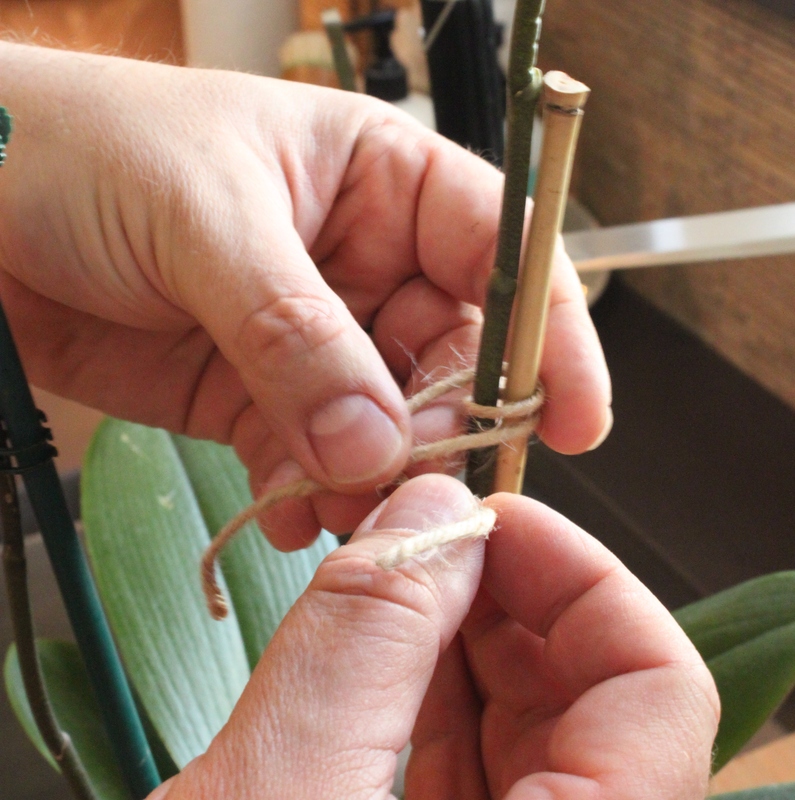 I loosely tie the orchid stem to the bamboo with jute twine. Loosely…VERY loosly, you don’t want to choke the poor guy. As a finishing touch, I cover the roots with wet moss. 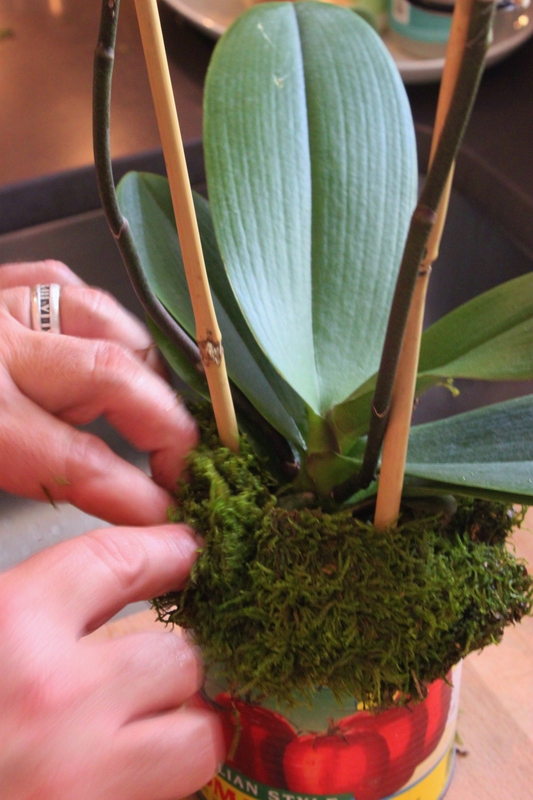 Run the moss under water, squeeze out the excess, and wrap it around the base of the plant….tucking it in. Gently push the flower petals outward. 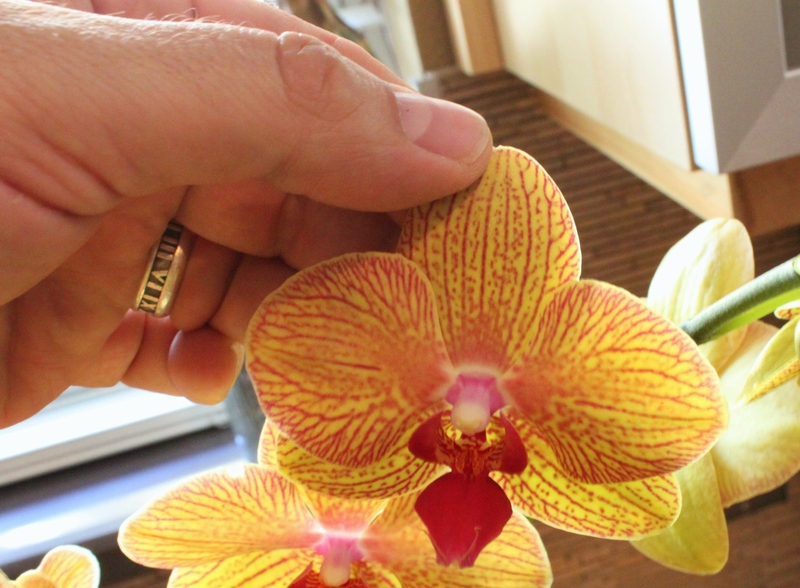 This makes the orchid flowers look…….happier. Careful not to tear the flower. Now my orchid is ready to go in a nice sunny spot, but not direct sun. 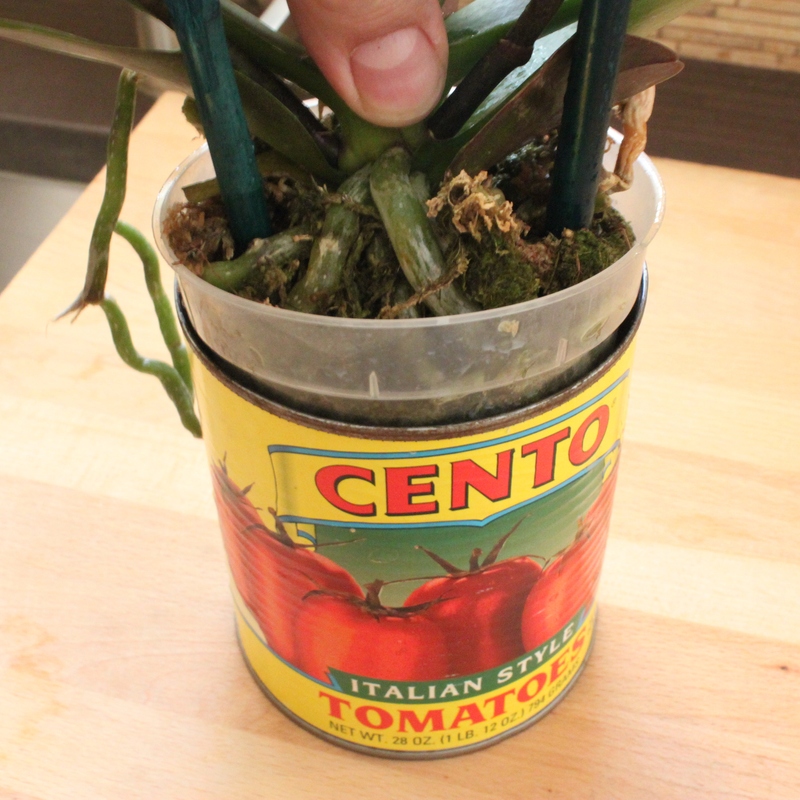 Maybe once a week, I’ll pop the plant out of the can and run it through water again….moist, but not sitting in water. 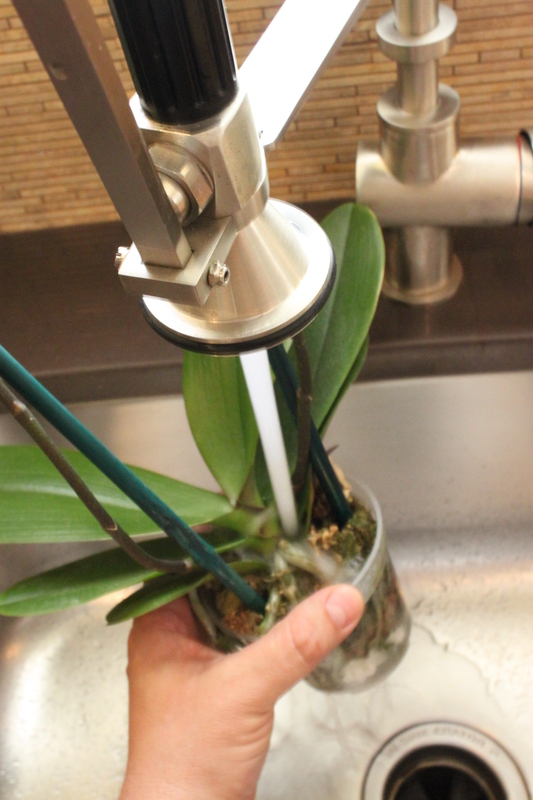 Love the mixture of can and orchid…I started using water with a little orchid fertilizer and freeze in old plastic ice cube tray. 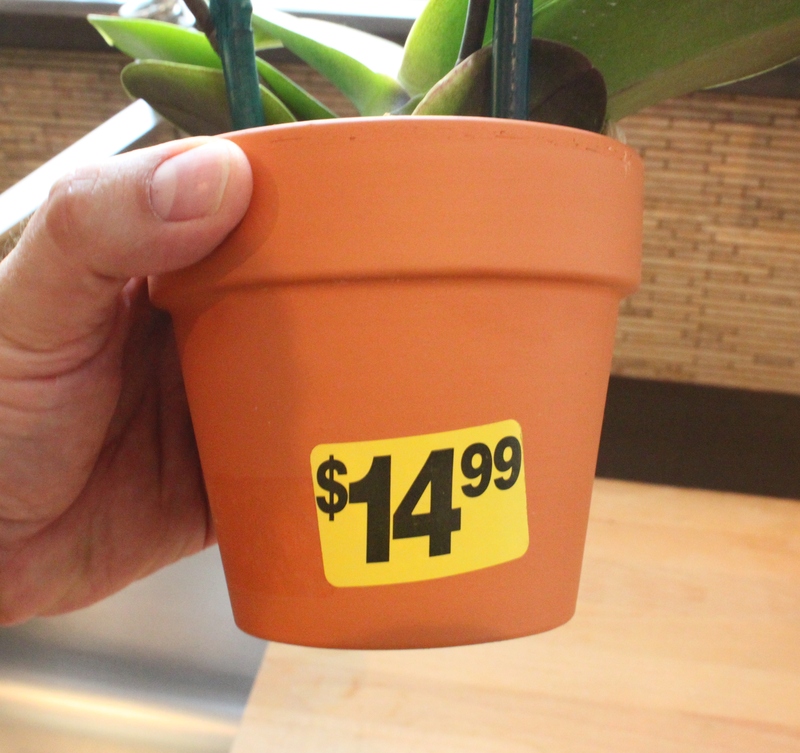 One of the big box stores sells “ice cube orchids” probably to keep people like me from over watering. So, I figured I could add a little fertilizer to the “cocktail.” They bloom pretty reliably year after year. What a great idea! I’ve used ice cubes before in my stores, they melt slowly and keep them moist. 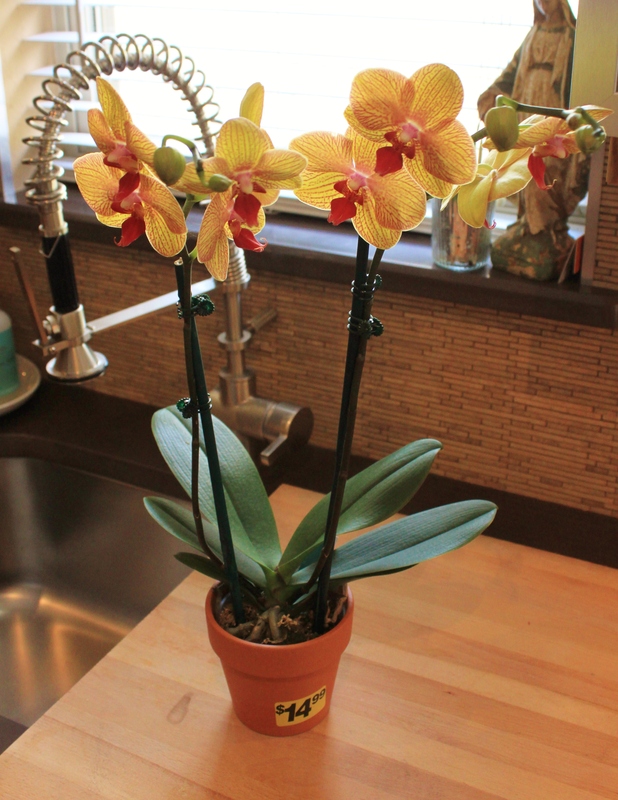 But I Rarely get an orchid to bloom again….. I look forward to your posts because I always know I am going to learn something or get some great ideas! I can’t believe how great that orchid looks in that can! Hi Tracie! We’re so glad that we can spread a little knowledge to people! And of course that orchid looks cool……I knew that it would all along. I have become addicted to orchids as well! We live “Up North” where the sun tends to go to sleep in the winter months, so my orchids look sleepy as well and don’t bloom! But WOW do they wake up at the end of January and give me hope that spring is coming! 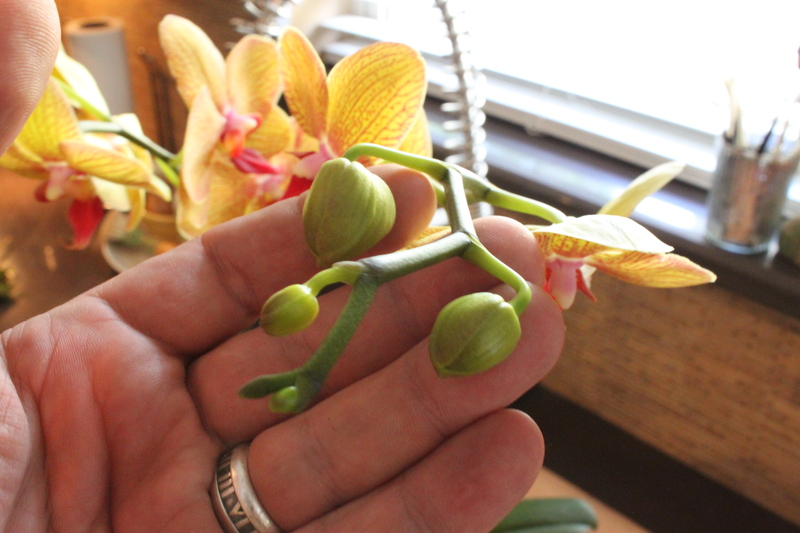 I have found that when a stem is done with it’s blooming I cut it back and dip the end of the cut stem with cinnamon…. 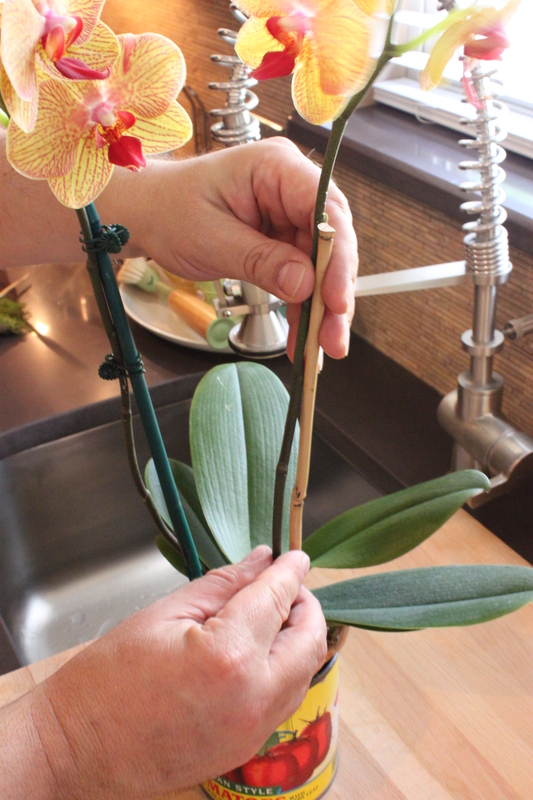 (read that on an orchid blog) and they amaze me with double new stems each year! Thanks for the idea of taking them out of the pot to water, I love it! Keep inspiring us guys! That turned out beautifully! In the last few years I’ve come to believe that plants and flowers are so much more fun in an interesting container rather than a vase. 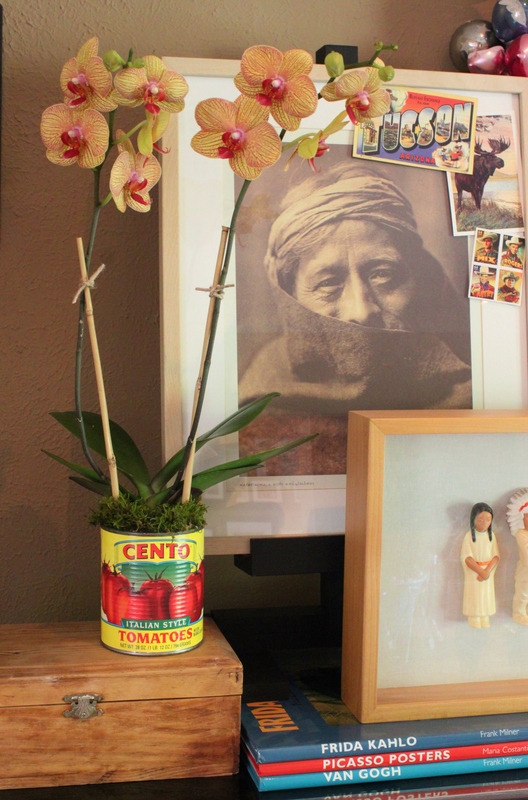 I’ll show this one to my mom…she’s the queen at growing orchids.